The Father's power and glory bright! From Thee they draw their life and light. And lifts the mighty cross on high. Down like a thunderbolt to Hell. Grant us with Michael still, O Lord! Be glory through eternity. Amen. Most glorious Prince, Michael the Archangel, be ever mindful of us, here and everywhere; pray always for us to the Son of God. Let us Pray. O God, Who in wondrous order dost ordain and constitute the services of men and angels, mercifully grant that our lives may be defended on earth by them that stand near Thee, evermore ministering to Thee in Heaven, through Christ Our Lord. Amen. R. O Lord, make haste to help me. Glory be to the Father, etc. Our Father once, Hail Mary three times, to honor the first Angelic choir. By the intercession of St. Michael and the heavenly choir of the Seraphim, may it please God to make us worthy to receive unto our hearts the fire of His perfect charity. Amen. Our Father once, Hail Mary three times, to honor the second Angelic choir. By the intercession of St. Gabriel and the heavenly choir of the Cherubim, may God, in His good pleasure, grant us grace to abandon the ways of sin, and follow the path of Christian perfection. Amen. Our Father once, Hail Mary three times, to honor the third Angelic choir. By the intercession of St. Raphael and the sacred choir of the Thrones, may it please God to infuse into our hearts the spirit of true and sincere humility. Amen. Our Father once, Hail Mary three times, to honor the fourth Angelic choir. By the intercession of St. Uriel and the heavenly choir of the Dominations, may it please God to grant us grace to have dominion over our senses, and to correct our depraved passions. Amen. Our Father once, Hail Mary three times, to honor the fifth Angelic choir. By the intercession of St. Barachiel and the heavenly choir of the Powers, may God vouchsafe to keep our souls from the wiles and temptations of the devil. Amen. Our Father once, Hail Mary three times, to honor the sixth Angelic choir. By the intercession of St. Michael Jehudiel and the choir of the admirable heavenly Virtues, may it please God to keep us from falling into temptation, and may He deliver us from evil. Amen. Our Father once, Hail Mary three times, to honor the seventh Angelic choir. By the intercession of St. Sealtiel and the heavenly choir of the Principalities, may it please God to fill our souls with the spirit of true and sincere obedience. Amen. Our Father once, Hail Mary three times, to honor the eight Angelic choir. By the intercession of the Seraphic St. Francis and the heavenly choir of Archangels, may it please God to grant us the gift of perseverance in the Faith and in all good works, that we may thereby be enabled to attain the glory of paradise. Amen. Our Father once, Hail Mary three times, to honor the ninth Angelic choir. By the intercession of Angelic Apostle, St. John the Beloved, and the heavenly choir of all the Angels, may God vouchsafe to grant us their guardianship through this mortal life, and after death a happy entrance into the everlasting glory of Heaven. Amen. 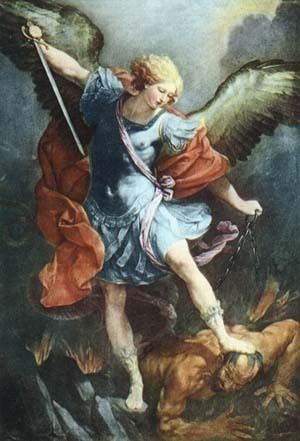 Our Father (seven times): in honor of St. Michael, St. Gabriel, St. Raphael, our Holy Guardian Angel, our Archangel of Holy Slavery, the Angels watching over our Religious Houses, and the Angel watching over our Remnant Catholic Community. Michael, glorious prince, chief and champion of the heavenly host, guardian of the souls of men, conqueror of the rebel angels, favorite of the household of God, under Jesus Christ our worthy Leader, endowed with superhuman excellence and virtue: vouchsafe to free us all from every ill, who with full confidence have recourse to thee; and by thy incomparable protection enable us to make progress every day in the faithful service of our God. Let us Pray. Almighty and eternal God, Who in Thine own marvelous goodness and pity didst, for the common salvation of man, choose the glorious Archangel Michael to be the Prince of Thy Church: make us worthy, we pray Thee, to be delivered by his beneficent protection from all our enemies, that, at the hour of our death, none of them may approach to harm us; rather do Thou vouchsafe unto us that, by the same Archangel Michael, we may be introduced into the presence of Thy most high and Divine Majesty; through the merits of the same Jesus Christ Our Lord.